October Newsletter - Mohave is available and new iPhones are here! Tip: If you're installIng Mohave , the new Mac operating system, make sure you have a CURRENT Time Machine backup. If something goes awry during the installation and you don't have a backup, you could lose your data! In September, Apple announced three new iPhone models. 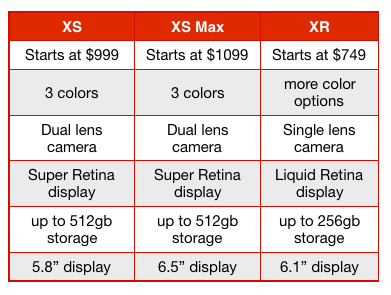 Below is a comparison of these new models. You can still purchase the 7/7+ and 8/8+ models. Thursday, Oct 11 - All About Photos. This class will give you an overview of the iCloud Photo Library, how to use and organize your photos using the Photos app and basic photo editing tools. ﻿Class is from 11-12:30 and $45. Registration is required and can be made via email to blair@applelearn.com .